Creature report! Creature report! Creature report! 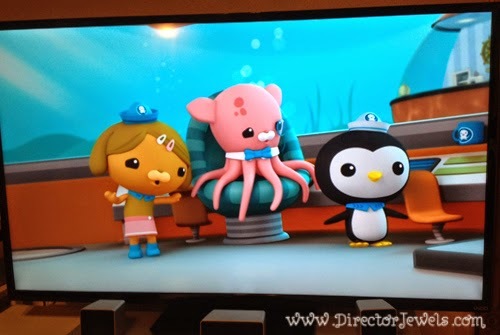 I've not made is a secret that my kids are obsessed with The Octonauts. These adventurous little explorers save the lives of hurt and sick sea creatures every single day! They happily abide in the Octopod, down in the deep blue sea, coexisting as only a cat, a penguin, a polar bear, a bunny rabbit, a dog, and a bunch of vegetable-animals (vegimals) can. They're an awfully prepared bunch - with Gups named after almost every letter of the alphabet, which used for exploring places like the Midnight Zone undetected by dangerous creatures that might eat them all. The vegimals, though mostly incapable of speaking, manage to be in charge of feeding the different animals meals that apparently fit within their food groups - you know, from raw fish to lettuce to seals (what?! That's what polar bears eat, according to Wikipedia). 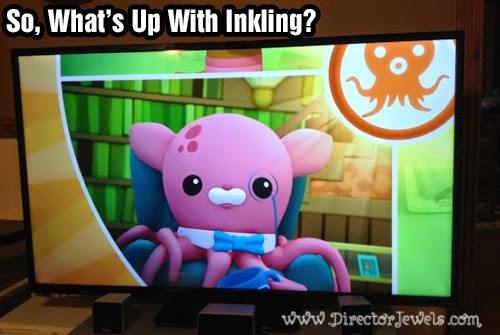 But perhaps the most puzzling creature of all who resides in the Octopod is Professor Inkling, a pink octopus who is rarely seen. I mean, he's there sometimes. Occasionally, he produces some knowledge (because, Professor - duh). But a lot of the time, he's entirely ignored. Which leads me to many deep and ponderous questions about this perhaps slighted character. 1. How precisely is he surviving? He's an octopus. The last time I checked, that's the sort of creature that needs to be actually living in water. In the photos here, we see Professor Inkling hanging out around all of the land mammals who have (of course) no problem breathing the air inside the Octopod. 2. Is he just too cool for school? Apparently, the hats worn by the rest of the Octo-crew are totally beneath him. His blue bow tie is sort of the same color, so perhaps that's his link to the rest of the crew. Also, shouldn't he be wearing Octo-boots on all eight of his legs? 3. What is his actual purpose? 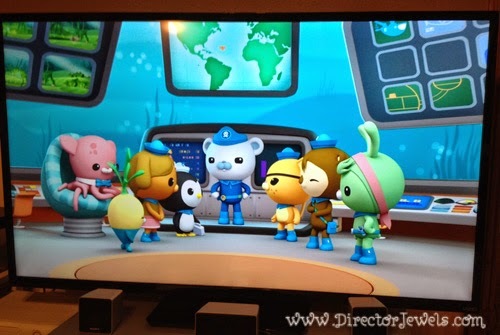 Captain Barnacles seems to be in charge of everything that goes on. Unless it's a medical situation. Or a meal. Or the repair of a Gup. Inkling's title of Professor indicates that he is knowledgeable about something...but, what, exactly? I would think it's pretty expensive to maintain this undersea ship that is fully powered and operational at all times. It seems that a professor might be better as a consultant from afar, instead of using up valuable resources like food and air (which he's not able to breathe anyway - see point 1). Am I right? All in all, it doesn't matter, though. Because Professor Inkling has a monocle. And monocles are pretty darn cool. Did you like this post? You may also enjoy Watch Out for the Shrinky Bush! We haven't read the books! Cool! Another problem, is apparently the real life version of his species dont actually expel ink.. I had no idea! Ha! What's up with his face? Why does he have a nose and mouth like the mammals? !